The view was wonderful, and it was very well located to shops and restaurants. 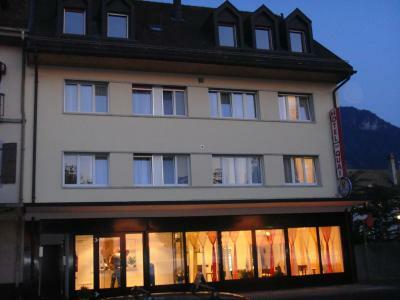 Very well located in Villeneuve, which is easily reachable from Montreux by train or by the lake promenade. Stunning view of Lake Geneva from our room window! Good price for the area. The staff is very friendly and ready to help. They all are excellent. Breakfast is not great but normall with everything on place, fresh and of good quality. Free safe and wifi. Good quality and well working sanitary ingeneering but badly located. Location is superb, lake view from the windows & they have a fan which is awesome in summer. The cleaning lady was very nice and made an effort. Everything was really nice, lean and easy. No big hurry for check-in or check-out, friendly stuff and it was fun to communicate with hands and legs due to the fact I was not able to speak french. Very comfortable bed and fantastic customer service. Hotel Du Quai This rating is a reflection of how the property compares to the industry standard when it comes to price, facilities and services available. It's based on a self-evaluation by the property. Use this rating to help choose your stay! 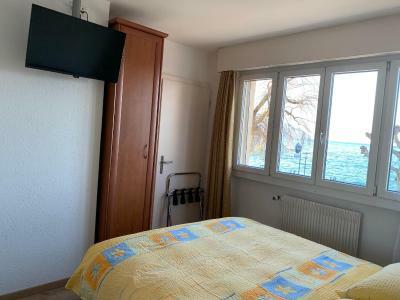 This nonsmoking hotel is located in the center of the picturesque town of Villeneuve, only steps away from the shores of Lake Geneva and a ship landing stage. It features a bar and free WiFi. Hotel Du Quai’s tastefully furnished rooms feature cable TV, a safe, and a bathroom with hairdryer. 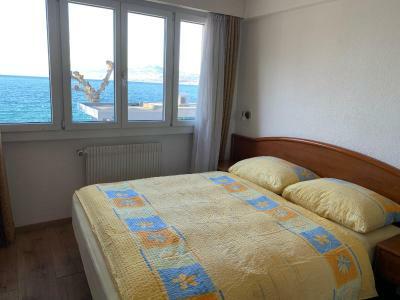 The rooms offer impressive views of the lake or the mountains. The train station is only a 2-minute walk away from the Du Quai. Chillon Castle is 1.2 mi away, Montreux is 2.5 mi away, and Gruyère is 14 mi away. The French spa town of Évian is 22 mi away. Free public transport passes for Montreux, Vevey and the Swiss Riviera are available on site. When would you like to stay at Hotel Du Quai? These well-lit rooms come with a double bed or a twin bed.They feature a work desk, a safety box, a sofa bed and cable TV. House Rules Hotel Du Quai takes special requests – add in the next step! Hotel Du Quai accepts these cards and reserves the right to temporarily hold an amount prior to arrival. -We were charged an extra 100 francs to get our third bed in the room, They didn't want to honor our reservation until we paid up. -There is no free parking. They told us to try parking at the school. - The room was thoroughly infested with bed bugs. I received several dozen bed bug bites. Breakfast could be better, few cold cuts in a small refrigerator bad in texture looked they were stale to me, so didn’t eat. They mention they have free parking but they don’t have you have to hunt for a parking place in nearby streets which is a task & it’s not free. Only at night it is from 8pm to 9am. The location just in front of the lac. Room was a bit small and the view from balcony was not great. First the room looked very basic and the bed not very comfortable, but I slept like a baby and it was a wonderful stay. The hotel is simple, but I'd go there again. Mattress was too soft for our taste. Breakfast was simple but great! Please make sure you and your travelling companions all get the free-transport card from the Montreux Riviera from the staff. The hotel staff told us that a single card was valid for both of us, but only later we learned that each of us should have gotten one card. On 1st floor can hear traffic on street especially if sleeping with windows open (required in summer).